Rick Lindner, creator of weddingspeechdepartment.com, helps everybody asked to give Wedding Speeches. Rick gives guidance every step of the way--from creating heart-felt messages, to controlling nervousness, to delivering speeches that makes them shine. He does this by providing tips in an easy to follow fashion to those who get their information by reading, listening, or doing. 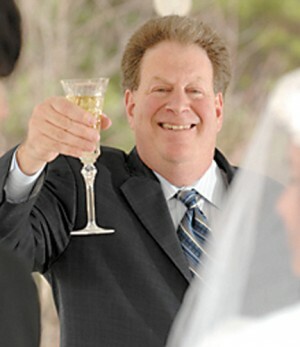 Rick has helped students, clients, and colleagues with wedding speeches and toasts since 1993. He believes that wedding toasts and speeches should be happy and fun. They should NOT feel stressful. Rick is an Assistant Professor of Communications for Georgia Perimeter College. He has also taught a number of public speaking, human communication, and business communication courses at Kennesaw State University and Georgia State University. He presented customer service and business communication workshops for such organizations as Xerox and Blockbuster. Rick is the author of Speak Up! and Up In Front—two books that help elementary school students with their public speaking skills. Rick earned his M.A. in Speech Communication at Georgia State University.